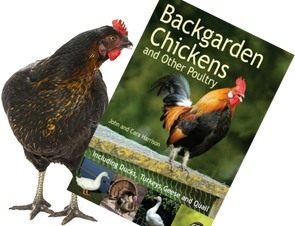 The Swedish Flower Chicken is a rare landrace breed from Sweden. A landrace is a breed which has been developed largely by natural, local processes in order to adapt to the local environment. It is in this way that it differs from a formal breed, which is bred to conform to a particular standard or purpose. The Swedish Flower Chicken is the largest native Swedish chicken breed. Swedish Flower Chickens are first mentioned around 1800, however it is likely that the breed may be even older. The demise of the breed was noted in the 1970s, in fact, only 3 known flocks remained. These were found in three separate Swedish villages: Esarp; Tofta and Vomb. It was, thanks to much painstaking work the future of the breed was once again restored. The Swedish Flower Chickens received gene bank status in Sweden in 2001 and are considered a rare breed. Flower Chickens are perfectly camouflaged for life on the Swedish plains. The standard of these birds is that they are non-standard! There are colour traits however each bird is individually speckled. Hens weigh 2-2.5kg. Cockerels weigh 2.5 to 3.5kg.